The watch bands are made of thick nylon and stainless steel hardware, the good material make the watch band lightweight and breathable; The texture surface provides a comfortable feeling to wear, the watch band are waterproof and washable, convenient for you to clean your watch band. 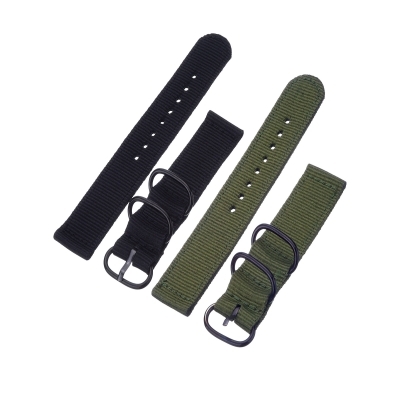 The package includes 2 pieces nylon watch bands, enough for your spare and replacement the old damaged one in daily life; They are easy and convenient to interchange and replace the old and damaged one. The nylon watch band are commonly applied for Pebble time, LG G-watch, Samsung R380 R381 R382, asus Zenwatch100 W110, you also can apply them for replacing other kinds of watch bands. There are 8 holes on the watch band, convenient for you to adjust its size to fit for your hand size. 1. Waterproof but not fireproof. 2. Make sure that your watch can match the watchband before you buy it. 3. There is no spring bars included.